Both Sandra and I read Halley's Casino and loved its fun adventure. See what we both thought of this first book in a trilogy and enter the giveaway to win your own copy! As soon as I read the quote at the beginning of this book I was drawn in. While not a sci-fi fan I love time travel - this novel is a perfect balance of the two genres. Nebula Yorker ("just call me Neb") is stargazing in 1986 California, waiting for Halley's Comet, and thinking about his parents, who mysteriously disappeared in the Amazon. What he experiences is Halley's Casino – an intergalactic casino disguised as a comet! Upon boarding it Neb's life changes forever. Eventually his nagging, lingering questions about his father and mother are resolved, too. This is a highly entertaining, funny read, with a creative plot, filled with a few earthlings, many androids (some with attitude) - "ladies and gentlemen and bisected species." John Lennon and the Stones, make "appearances" in this cleverly-crafted, somehow familiar atmosphere for Star Trek fans. It’s the same but different! I appreciate the author's attention to detail as shown in the description of Archibald Tict (from the Casino who becomes Neb's friend and mentor) a five-foot man hailing from 1707 England with pure white hair, a black tuxedo and bowtie, intense red shoes equipped with anti-gravity hopper inserts that cushion his feet. I could visualize him! The author reminds us that the ever-present problem with time travel is being tempted to change history and/or in the words of a time traveller in the novel, "you can keep going back, though not at the same instant or you might bump into yourself." Wow! I highly recommend this exciting, fast-moving, excellent blend of time travel and science fiction! Halley's Casino is a fun adventure that is a good mix of sci-fi, time-travel and comedy. From the first page down to the last, I was entertained and never bored. It was unpredictable, funny and filled with memorable eccentric characters. The story opens up with a scene of a young man named Nebula Yorker (I just loved that name) who was out in a field in the middle of the night looking out through his telescope for Halley's Comet. An event that happens only every 75 years. But Nebula was in for a surprise when, instead this comet turns out to be an intergalactic spaceship casino that picks him up and takes him on an adventure that changes his life. 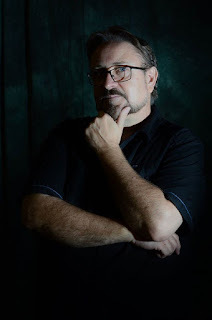 Author Mark JG Fahey has a vivid imagination as he puts together a plot full of surprises that will delight fans of Star Trek, Rock 'n Roll and time-travel. The book has a smooth flow, is filled with tongue-in-cheek humor, and is just plain fun to read. A feel-good book that is perfect after having read a heavier dramatic book or if you need a light read that will make you smile throughout. I think Halley's Casino would make a great movie that would garner fans rather quickly. It's also a clean read with only one crude word (sh*t) on the first page and then that's it. I really enjoyed this book that won 3rd place in World's Best Story contest. It's the first book in a trilogy and I look forward to reading the second book Marine, which sounds like another super fun adventure. Even though it's part of a trilogy, the ending is satisfactory with no cliffhangers. It stands well on its own. Oh, and Fahey is a Canadian author who lives but two hours from me. I hope to meet him someday! Mark JG Fahey is not an alien, contrary to what you may have heard, though he swears he has been to space. Mark has dabbled in various undertakings throughout his illustrious career, from on-air hosting/reporter/stand-up comic to messenger for the Prime Minister of Canada. Mark also holds a degree in Restaurant Services. His family and friends can attest to his excellent cooking skills. Born in Ottawa, Ontario, Canada, Mark was raised and still resides in Aylmer, Quebec, Canada. 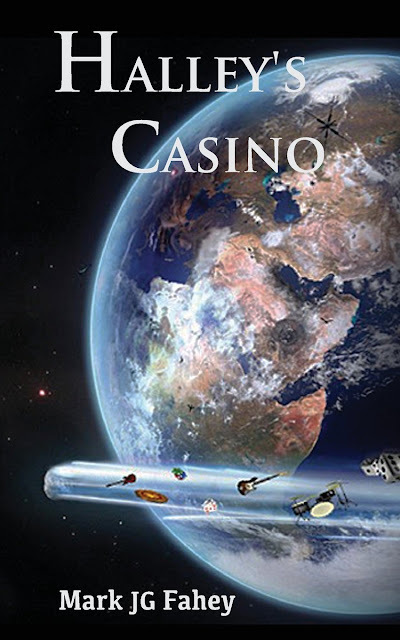 Halley's Casino is the first book in the Halley's Casino trilogy. I don't usually like time travel, but I tend to enjoy light sci-fi and this one sounds like a lot of fun. It was a surprisingly fun and entertaining read!